Heart + Bowl - Page 14 of 16 - Food with soul. It’s no secret – I’m a massive tea drinker. Gasp! A British girl who likes tea? Well I never… Yes, we’re a tea guzzling nation like no other, and I’m just another tea junkie. But in recent years I’ve grown out of my bog standard English Breakfast addiction, after discovering a huge variety of different blends. Who knew there was a whole big, exciting world out there filled with tea?! Fragrant, floral, spiced, iced, fruity, minty – I’ve tried them all. I’ve become well travelled in this tea world, and toured the diverse landscape of earl grey, green, chai, herbal and fruit blends. I’ve brewed hundreds of tea bags, loose leaf blends and matcha lattes. Each one of them delicious in their own right. Some of my favourite shops and brands to try are teapigs, Whittard and Kandula. But no matter what the blend, I’m always on the look out for the perfect cuppa accompaniment. Enter – Apple Spiced Tea Cookies! Are you ready for a tea-cookie sensation? With just the right amount of sweetness from dates, nuttiness from coconut and spice from cinnamon, they partner with loads of different blends. Not only that, but these Spiced Apple Tea Cookies are so super healthy – you might even be tempted to have one with your morning brew. While these cookies will go with most tea blends, I’ve included some suggestions in the recipe notes that may rock your world. Yes… your metaphorical world of tea. Place all ingredients in a food processor and mix until a thick paste forms. Form into 6 round, flat cookies and place on the lined baking tray. Bake for 15 minutes, or until just turning golden. The cookies will still be a little soft once out of the oven, so let them cool completely before moving and serving. These cookies will work alongside most tea blends, but try with Earl Grey or Vanilla Chai for a perfect pairing. Finding somewhere to eat in an unfamiliar city can feel like a daunting task for those of us suffering with food allergies, intolerances or just wanting to eat clean. Especially when you don’t want to revisit the generic gluten-free menus from the usual suspect big-name chains. I don’t know about you, but when I take a trip to a new city, I want to check out unique independents or local chains, places I wouldn’t be able to find in my local hometown. Sadly that’s become a real challenge when travelling, and extensive planning and research needs to be done. Before a trip to York with my partner, I apprehensively started googling places I could eat. Quite quickly I realised, I need not have worried… I found Filmore and Union. Filmore and Union offers up healthy, wholesome food and drink, packed full of nutrition. Everything is made themselves, so they know exactly what ingredients are used. I knew I was on to a winner when reading their website ethos “At Filmore, we understand that eating out can be a struggle when you suffer from food allergies, to the point where you have to redesign a meal for your needs, which totally ruins the fun of going out. Fortunately, that’s where Filmore comes in. That fact that people with different dietary requirements can choose something enjoyable from our menus, with the assurance that their bodies will agree, is what really sets us apart from other brands.” A breath of fresh air. More of this please! We arrived at lunchtime, and I was immediately drawn to the rustic decor of the restaurant. It was light, bright and inviting. We quickly sat down and looked at the menu. Filmore and Union offer food from breakfast to dinner, as well as all day options, so there was tonnes of great choice. Everything on the menu clearly specifies allergy free options, with simple icons to look out for. Trust me, there’s something for everyone. For drinks my partner ordered their organic coffee, and I tried a Super Antioxidant smoothie, made from strawberries, blueberries, cranberries, mint and coconut water. Needless to say, it was delicious. Choosing lunch was difficult. Just because I’m not used to having so many options to choose from! In the end, me and my partner both landed on the warm Moroccan Spiced Chicken Salad, with mango, broccoli, spinach and courgette noodles. When it arrive, the plate was beautifully decorated with edible flowers and it smelt incredible. After my first mouthful, I’d already concluded it was the best salad I’d ever eaten. Could a salad really have that much flavour? Seriously!? Well now I know it can. We also ordered a side of celeriac chips to share. These were super tasty, and an interesting healthy take on the humble chip. Originally we didn’t intend on ordering dessert, but all the freshly homemade cakes on the counter looked too appealing to pass up. It would have be a crime not to. I ordered an almond milk cappuccino and the Vegan Brownie, which was also gluten free and made with hemp and kale. It was served with fresh berries and a sweet berry compote which partnered perfectly with the chocolate brownie. I thought nothing would be able to match up to the mighty salad I’d had for my main, but the brownie definitely held it’s own. It was a deserving dessert, and concluded what was truly a one of a kind dining experience. Filmore and Union feels like a refreshing choice in today’s world of dining out. Proving that delicious food can be nourishing and good for you. It’s the kind of food that makes you not miss the allergens you can’t eat. Eateries like it have been long overdue, and Filmore seems like an answer to so many people’s ever-growing needs. The restaurant was packed from the moment we sat down, to the moment we left, and people were actually waiting for tables to become free. There’s definitely a demand for healthy, allergen friendly food at all times of day, and Filmore seems to be tapping into that need. Yes, in the UK these days it’s easy enough to stumble across a gluten-free menu in any large chain, or a vegan cafe in London, but Filmore and Union offers this and more on a regional level. With 7 regional locations, they are definitely doing something right. After my visit to York, I can only hope a Filmore and Union pops up in my home city of Norwich sometime soon, and that they continue to inspire a refreshing, inclusive attitude, to eating out for all. Ok, so I’ve use the word “Truffle” very loosely here. In all honesty, these are nothing like truffles – I’m not even going to pretend. There’s not a chunk of chocolate in sight. 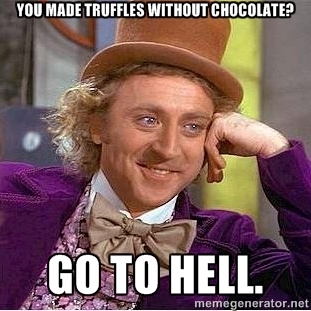 Sorry Willy Wonka! But if like me, you’re looking for a healthy alternative to cocoa, these little guys are the golden ticket! They are pretty damn healthy and will fuel you with energy, as well as satisfy your sweet cravings. Aside from ditching the cocoa, these Vanilla Coconut Truffles are also gluten, dairy, nut and refined sugar free! Yep, Willy Wonka is really not happy. While these Vanilla Coconut Truffles are delicious, I’ve included some different options for flavours and decoration in the recipe notes, incase you wanted to mix things up! Go on, live on the edge. Place dates into a bowl, and pour over enough warm water to cover them. Soak for 5 minutes and drain. Place the dates, shredded coconut, salt and vanilla extract into a food processor. Process until think and sticky. Place a little extra shredded coconut on a small plate. Form the mixture into little balls, rolling in the coconut flakes for decoration. Place on the lined baking tray and bake for 12 - 15 minutes, until just golden. To mix things up, try coating the truffles in raw cocoa, chopped nuts or matcha powder.